Unless your site is comparable to Amazon’s product assortment, traffic and sales volume, it’s safe to say your target customer is different than Amazon’s. Amazon targets and attracts anyone and everyone. You likely have a smaller universe of customers with different motivations, expectations and needs. Your goal is to optimize your site for your customers. Familiarity with Amazon makes people more accepting of its shortcomings. For example, in a 2006 usability study, despite having the slowest perceived page load speed and one of the most confusing home pages, users said before and after usability testing that they were likely to use or recommend Amazon to a friend. Customers who have never heard of you or visited your site before may not be so tolerant, so you cannot benchmark your site performance against Amazon and think you’re doing okay. Neither should you copy design ideas – especially when it comes to Amazon’s shotgun method of filling pages with as much content and calls-to-action as possible. Amazon is not just a pureplay online retailer (meaning it has no brick-and-mortar stores) – it’s also a marketplace. A formidable competitor to eBay, anyone can sell their wares both new and used on the ‘Zon and leverage its user base, search engine optimization, reputation etc. 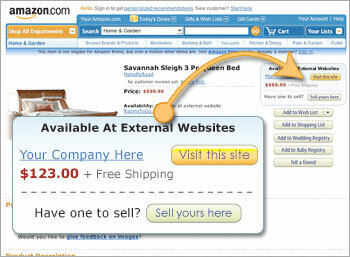 Amazon also allows external websites to advertise through its pay-per-click and display advertising programs. This creates many competing calls to action which might make Amazon money (who knows), but that doesn’t give you license to do the same. You’re likely better off with a few strong calls to action aimed at keeping customers on your site. This also impacts the design of Amazon’s calls to action. Bryan Eisenberg, author of Always Be Testing, shared with Get Elastic readers an anecdote about his own conversion optimization clients years ago. Amazon used to have a point of action assurance on its cart button “you can always remove it later.” (Keep in mind that in the mid to late 90’s, people weren’t sure what would happen when they clicked anything and needed this assurance.) This was, at the time, best practice. When Amazon removed that text, customers called Bryan crying they should follow the leader and change their buttons likewise. What they didn’t understand is that Amazon didn’t shrink the button to improve conversion, rather it changed its business model to include used books, and needed the extra space on the page. The design change actually reduced conversion, while the business change ultimately improved profits. Amazon can afford to sell items at cost or even a bit below cost on some items because it enjoys quick inventory turnover. Jared Spool shares the example of Amazon vs. Best Buy. Assume Best Buy and Amazon receive iPods from Apple with credit terms of 45 days. Amazon turns its stock over in 20 days, on average. 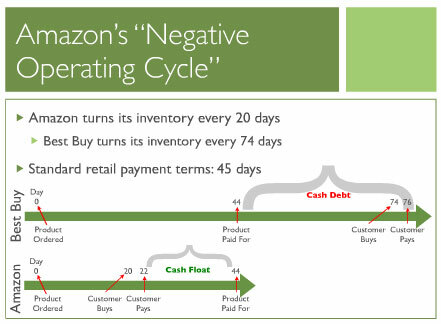 Collecting all its cash from customers up front within that period leaves plenty of days before payment is due to Apple, during which Amazon can turn its profit by investing customer cash. Best Buy, on the other hand, turns inventory every 74 days, and must borrow money from day 45 to 74 to pay its supplier. Truth is, not many businesses can survive by playing pricing chicken with Amazon for very long. “Price it like Amazon” is not a winning strategy. We know free shipping is the darling of promotions, and many online shoppers refuse to purchase an item that tacks on a shipping charge. But many retailers simply can’t afford to offer free shipping all the time, on everything or at a certain cart total threshold. Amazon’s set the free shipping bar so low at $25 dollars, it’s tough for other retailers to match. Thanks to uber-efficient distribution systems, Amazon can keep stock in multiple warehouses across the nation so orders can ship from the closest warehouse at the lowest costs and quickest speed. Moving the volume that Amazon does also gives them primo negotiation power with shipping carriers. Most businesses simply don’t enjoy these efficiencies. (Despite this logistical magic, Amazon’s free shipping program can still negatively affect its gross margins). It’s important to figure out if you can afford to offer free shipping, rather than yield to the pressure to match Amazon’s free shipping threshold. Amazon began as a long tail business, meaning it specialized in selling not only hits but also obscure book, music and DVD titles. It soon grew to include the long tail other goods, too. This presents a challenge for merchandising. Amazon has built a sophisticated product recommendation engine that powers its “You may also like,” “Customers who bought this also bought,” “Frequently bought together” cross-sells using collaborative filtering technology. Amazon must use its massive record of site behavior to make these product associations – it’s simply impossible to do manually. Similar product recommendation technology is available from vendors like Strands, Baynote and Rich Relevance (built by ex-Amazon employees), and I’m all for them. But simply having the technology that Amazon has is not enough. You have to apply rules and constraints to your tool to ensure your cross-sells and upsells are meaningful and attractive to customers. And depending on your industry, product assortment and customer, you may be better off with manual product associations. For anything community-driven to take off, you need a critical mass of users, otherwise it’s not useful to anybody. For example, an online forum or dating service can’t survive on a handful of active users. Amazon’s user base and sales volume gives it an advantage in testing out community tools like product reviews, video reviews, user photos, forums, Listmania and so on. Did you know that the ratio of sales to reviews on Amazon is 1,300 to 1? Amazon has to sell a product 1,300 times on average before someone is kind enough to submit a review. Now, I’m not saying don’t use customer reviews on your site because your sales volume isn’t high enough. Remember, you may have a different type of customer, and you can be proactive in asking for customer reviews, among other ways to encourage them. I’m only illustrating that few participate in community efforts on your site, and your time and money may be better invested in other activities. (I do believe customer reviews are a must-have, I’m talking about forums, chat rooms, tagging, etc). Also, remember that not all Amazon’s social bells-and-whistles are successful. There have been several social projects that never gained traction with users. Hey, I certainly drink the always-be-testing Kool-Aid, and I think you should too. Bottoms up. In fact, I’m presenting a 1 hour webinar on site testing this month (shameless plug). But the problem with copying Amazon is you don’t know what’s a test and what’s a permanent fixture of the site. You may be copying a test element that is a big loser. You simply don’t know! There’s enough bank at Amazon to take risks on projects with little or no ROI. And if they try something that isn’t a blazing success (cough, Gold Box, cough), they can just buy another company that does it better (woot woot). If I haven’t convinced you yet, just take the word from 3 of the most respected folks in web usability and conversion optimization, Bryan Eisenberg, Jared Spool and Jakob Nielsen. These guys are geniuses and they warn against copying Amazon (and you could insert-your-competitor-here). So what should you do instead? Test everything for yourself. If you’re still making marketing decisions based on “gut feel” – you’ve already fallen behind your competitors. The truth is, our gut often betrays us. We rely on “best practices” that might not work for our unique business, products and customers. We redesign year after year, never understanding what produced an improvement or decline in our sales and profits. We buy more traffic rather than making the most of the traffic we already have. It doesn’t have to be this way. Those who have dipped their toes in the testing stream may not be reaping the full benefit because they are focusing on the wrong things, using inappropriate testing methodologies or drawing improper conclusions from their data. Whether site testing is still a foreign concept or you’ve had experience with it before, Taking Your Site Performance to The Next Level With Optimization Testing is for you. It’s happening Tuesday, July 20 at 9am PST / 12pm EST. Sign up today!